The second thing I do every morning after I get up is walk into the kitchen and fire up my coffee machine. I make enough to fill up three big cups to last me the next few hours. The moment the first drop hits my lips, all is good in the world. To put it lightly, I love the stuff, but am I leaving myself vulnerable to all the negative risks of drinking coffee? Over half of Americans—54%—over the age of 18 drink at least one cup of coffee per day. And those who don’t drink coffee are still consuming caffeine in one form or another, such as tea, soda, and energy drinks. There are reports that the average American consumes 300 mg of caffeine per day, which is about three cups of coffee. But there’s a lot of controversy surrounding the health risks and benefits of drinking coffee. Some consider it a health drink, others see it as dangerous, and I find myself in the middle. From what I can see, depending on your health and how you drink coffee, you could either be helping or harming yourself. Caffeine causes acute increases in blood pressure that last for about four hours after consumption. It’s a short-term effect, so if you have healthy blood pressure, this is not a big deal at all; however, if you’re hypertensive, it is a big deal. Furthermore, people who regularly consume caffeine and have a higher tolerance may experience less of a spike. As far as the long-term benefits for heart health go, results are inconclusive. Straight caffeine tends to cause a significant bump, while caffeine from coffee causes minimal change. Of course, if you’re loading coffee up with sugar, syrup, and other sugary additives, it can impact your heart health substantially—but this has little to do with caffeine. Sugar is responsible for high blood sugar, weight gain, risk for type 2 diabetes, and high cholesterol. The solution is simple: cut out or limit the sugar you add to your coffee! Studies have shown that drinking coffee—even up to four cups per day—can reduce your risk for diabetes, liver cancer, cirrhosis, heart disease, and Parkinson’s. But once again, some of these benefits can be muted if you’re adding all kinds of stuff to your cup of coffee every day. 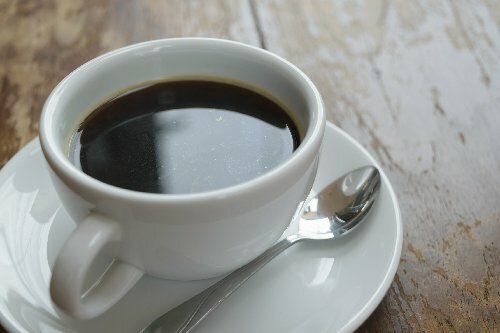 I think if you’re currently healthy and don’t have any major health conditions, drinking up to four cups of black coffee per day won’t cause you any real harm. However, too much caffeine can cause anxiety and difficulty sleeping, so it’s important to take that into consideration! “The Dark Side of Dark Roast?” Examine.com; http://examine.com/nutrition/dark-side-of-dark-roast/, last accessed August 29, 2016. “Coffee by the numbers,” Harvard T.H. Chan School of Public Health; https://www.hsph.harvard.edu/news/multimedia-article/facts/, last accessed August 29, 2016. “Coffee & Health,” Harvard T.H. Chan School of Public Health; https://www.hsph.harvard.edu/news/multimedia-article/benefits/, last accessed August 29, 2016.